Heads up traders! Tomorrow, at 12:30 pm GMT, a huge set of fireworks will be coming your way as the U.S. releases its employment report on Friday. According to market consensus, payrolls are expected to rise more than last month’s disappointing figure. The employment report is slated to show that 176,000 net jobs were created in April versus the 120,000 increase in March. Also, the unemployment rate is anticipated to remain at 8.2% while average hourly earnings probably rose 0.2%. Generally speaking, market geeks seem to have a positive bias. However, Goldman Sachs, one of the most profitable trading firms in the whole world, isn’t as optimistic. Goldman Sachs analysts believe that only 125,000 jobs were added in April as the effects of the warm winter that helped support employment late last year wear off. Goldman Sachs also cited the weak GDP in the first quarter. From January to March, the U.S. economy only expanded 2.2%, and not 2.5% like the market had initially expected. To Goldman Sachs, the jobs report will simply showcase a weakening economy where demand growth isn’t able to keep up with the buildup in inventory. As retail traders, who are we to believe? The majority of the market or Goldman Sachs? My answer is it doesn’t matter. The NFP could go either way, so what’s important is for us to have a game plan for the different possible outcomes. Let’s take a look at the reaction of EUR/USD in the last few releases to come up with ideas on how to trade the upcoming report. 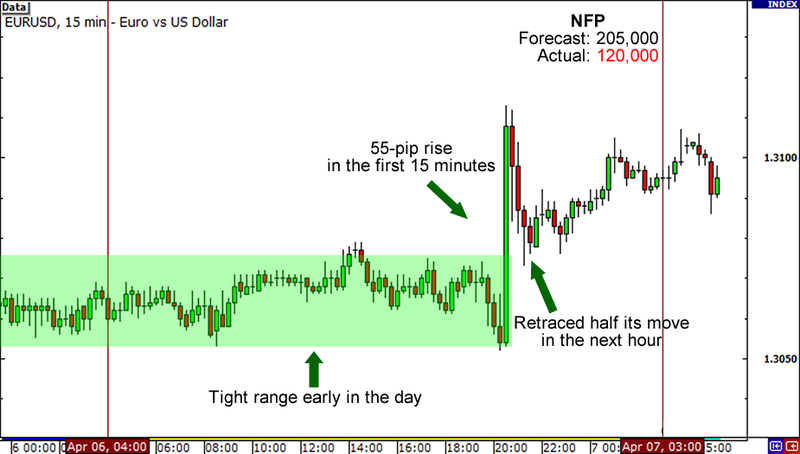 NFP figures came in much higher than expected in March. New jobs created were at 227,000 when market geeks were only expecting 210,000. As a result, EUR/USD dropped by 63 pips in the first hour alone and the pair even made new intraday lows before the day ended. This suggests that the NFP number is directly correlated to the dollar’s strength. 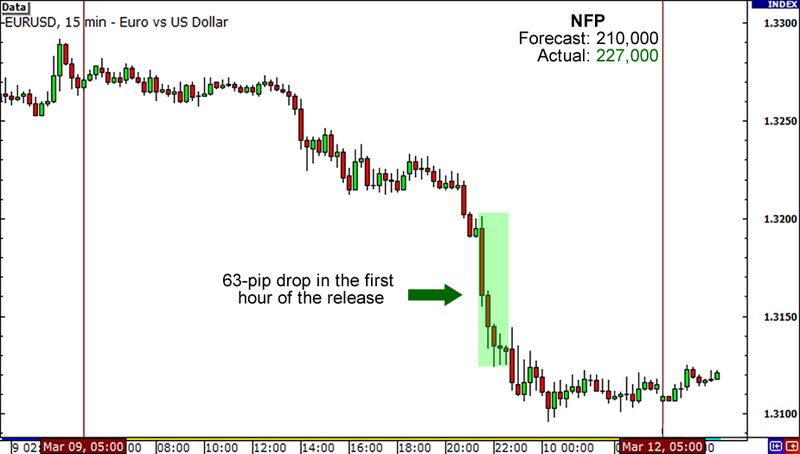 Unlike March’s price action, the NFP release last April looks like it was much more anticipated. EUR/USD traded on a tight 25-pip range during the Asian and most of the London session until the surprisingly disappointing NFP report came out. The non-farm payrolls printed an increase of 120,000, which is a lot lower than the 205,000 figure that many were expecting. As a result, the dollar weakened enough to push EUR/USD by 55 pips in the first 15 minutes. Profit-taking soon dragged the pair to retrace half of its initial move, but EUR/USD crept back higher and ended the day near its intraday highs. How do we trade the report? It seems that going with a breakout trade is our best bet. In the last 7 NFP release dates, price consolidated within a 20-25 pip throughout the Asian and European trading sessions. When the report came out, price broke out strongly in one direction. What we can do is wait for a range to form during the Asian and morning European session and then buy or sell on the breakout. The move doesn’t last for very long and price normally stalls and retraces once four to eight 15-minute candles form. Stop loss points can be placed on the opposite side of the breakout while profit targets can be anywhere from 30 to 50 pips. That’s it for today folks. If you have a different strategy, feel free to hit me up in the comments. I’d love to hear other points of view! How will you trade the non-farm payrolls?